Stretch is an unfortunate reality of woven sails. Quantum's David Flynn takes a deeper dive on the topic and explains why it's a problem, how it happens, and how to fight it. The number one enemy of woven sail performance is stretch. Of course, the definition of performance may vary for cruising sailors, but performance is really more about control over heel and weather helm and optimizing upwind angles and less about boat speed (though that is not a bad thing). Performance is also very much about the functionality of the systems you rely on to make sailing easier–the furling system for your headsail or the in-mast or in-boom system for your mainsail. Stretched sails threaten the functionality of all these systems and ultimately your sailing experience. If your sails stretch and the shape becomes fuller as the breeze builds, all sorts of bad things happen. When sails are too full, they become harder to trim and will cause you to heel more than you should or want to, and the boat becomes difficult to control. Balance is lost and you get more weather helm, causing you to have to fight the helm. Bad sail shape also compromises your ability to sail upwind. Full, bloated sail shapes are a particular liability if your destination happens to lie to weather. Stretched sails can cause issues with your sail handling systems. 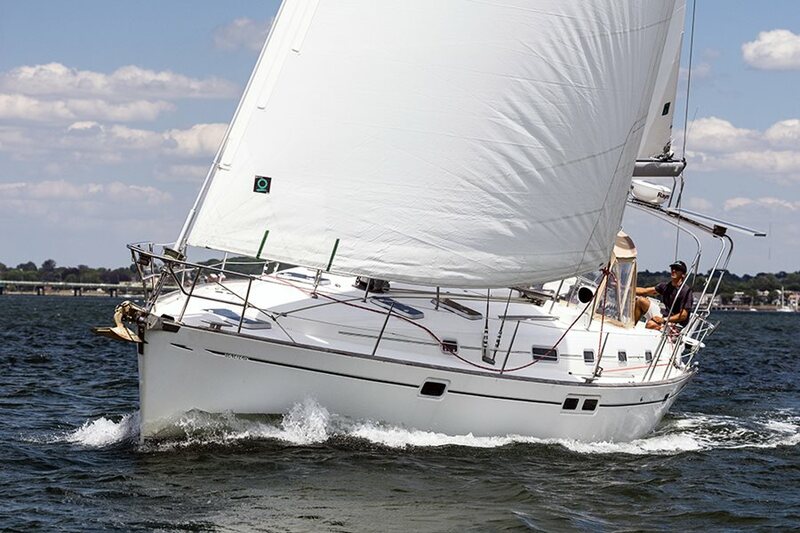 I challenge you to find a cruising boat that doesn’t use at least a headsail furling system and depend on one sail to be big and powerful in light air, but flat and small in heavy air. Nowhere is there a better case for less stretch. Have you ever had an in-mast furling system jam up as the sail bunched and creased, making it impossible to roll in or out? The culprit was probably stretch. In-mast sails must remain flat and smooth or they won’t roll up properly in the small cavity provided. In-boom systems also have a small space in which to stuff a lot of sail. They rely on precise boom-and-batten angles to get everything to line up and fit in. If the leech stretches and the angles change, the system doesn’t work. Think about the wasted effort of pulling on the furling line when your sail is stretched. The sail has to stop stretching before anything moves. Everything works better with less stretch. (Think about that for control lines as well). In the end, the functionality of all furling systems is compromised by stretch. If you look closely at your woven sail material, you will notice hundreds of small, woven fibers. The fibers go over and under the fibers running in the opposite direction. This distortion is called crimp. When the sail is put under load, the fibers have to straighten out or stretch before they can begin to bear load. Since stretch is a function of load, the bigger the boat the higher the loads, and the more difficult it becomes to maintain flat, clean shapes–especially over the life of the sail. There are very few woven sails built for boats over 70 feet today. The loads make composites the only reasonable option. The good news is you can combat stretch; the bad news is that it is a never-ending battle. Every time you hoist a brand new woven sail, it will stretch. The more load you carry, the more it will stretch. The way to prevent your sails from becoming too stretched is to monitor their sail shape with photos, and work with your sailmaker to have the sail periodically recut. As long as the sail material is in good condition, a sailmaker can remove the excess fabric and bring it back to approximately 90 percent of its original shape. If you’re in the market for new sails, composite–or membrane–sails are an excellent choice for cruisers. They are more costly upfront, but they resist stretch much better than woven materials as they are made with unwoven, bigger fibers. These fibers are protected with classic woven polyester (called taffeta in the trade) exterior skins. These lightweight outer layers protect against chafe, wear, and UV damage. There is usually a layer of polyester film inside, too. The film is equally strong in all directions, so it can help support the off thread line, or bias loads. Protect your sails from unnecessary exposure to sunlight and heat. The sun might not stretch your sail, but UV rays are a sail’s nemesis and can burn the material, rendering it unusable and disqualified for a recut when the time comes. Avoid prolonged luffing and flogging. Flogging must be avoided since it will shake out the resin that holds the weave together. Motor with your sails down unless they can be filled. Never back a genoa against the spreaders when tacking. Use the correct halyard tension. Halyard tension changes as a function of apparent wind velocity. Add just enough tension to remove horizontal wrinkles as the apparent wind increases. Ease when the apparent wind velocity drops. Protect from chafe. Make sure spreader and chafe patches are in the right place. Take sails off the boat when it is out of the water or not in use or for any extended period of time. Periodically rinse sail with fresh water. Annual professional servicing and washing is recommended. Store sails dry. Be sure roller furling sails are well secured when leaving the boat. As your sailmaker, we’re here to help you fight the battle against stretch and make sure you get the most out of your investment. We are always a phone call away to arm you with information and help guide you to the best solutions. If you're interested in learning more about alternative sail constructions, especially for cruising, check out these other articles: Demystifying Modern Cruising Sail Design and Composite Sails for Cruising.